Concerts: a room full of strangers united by their love of music. 365, 105, 63, 32, 20, 15, 5, 4, 3, 2, "I’VE GOT A SHOW TODAY!" There is no greater feeling than waking up on the morning of your concert and realizing that in a few hours, you will be in the same room as your favorite artists. I still remember nearly every detail about my first time seeing my favorite band in concert at Metlife Stadium. The butterflies, excitement, and tears are still fresh in my mind. 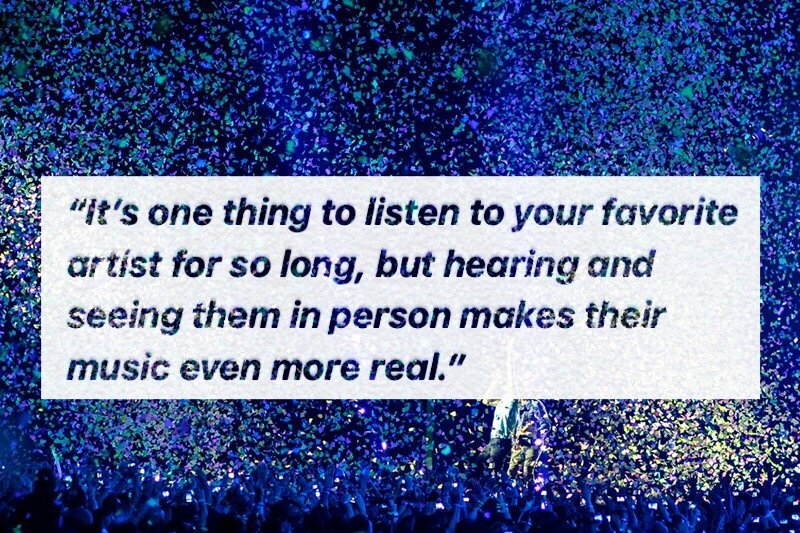 Here is a list of 10 reasons why I think concerts are magical, ethereal, and pristine! 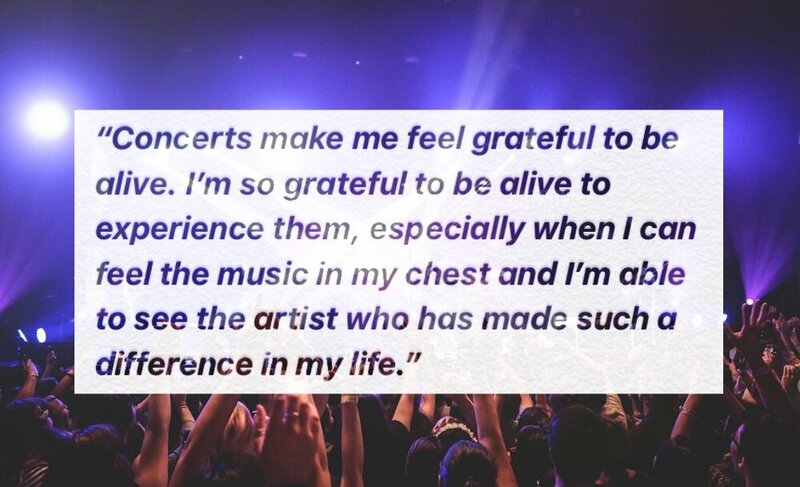 I asked my friends and Twitter followers to describe how concerts make them feel, and I have included their quotes below. I think that the most beautiful thing about attending a concert is the sense of unity you feel with the strangers around you. You have never met those people and will most likely never cross paths with them in the future, but for those few hours, you are all sharing one experience; you are part of a greater picture. Tickets are a confirmation that you will be seeing your favorite artists in the future. The process of attaining them on Ticketmaster is stressful (if you’ve ever tried to get good seats to a show, you know this is true!) but worth it in the end. 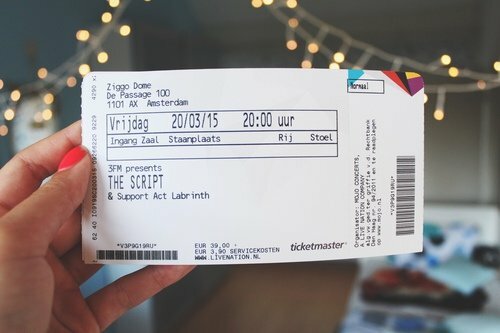 Whether you buy your tickets or have them given to you by someone, the feeling of having them is amazing. Many people work for months to be able to afford to go to a concert they really want to go to, so finally having them is extremely rewarding. Knowing that you have a concert to go to gives you a reason to keep going a lot of times. People go through so much in everyday life, so knowing that in a few months, they’ll get to have an amazing time watching their favorite singers, gives them a reason to push through all the hardships. The feeling of seeing your countdown grow smaller and smaller is amazing. Fandoms exist for nearly every band/artist. 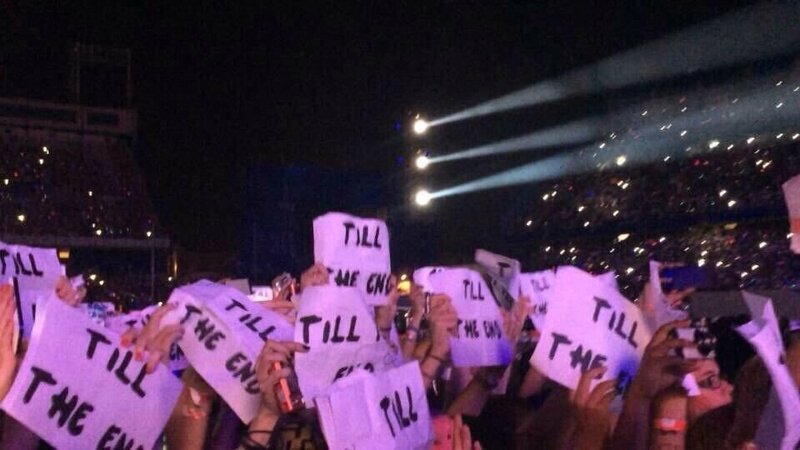 People in these fandoms typically organize fan projects that consist of having everyone print out signs or bring things to hold up during a specific song. 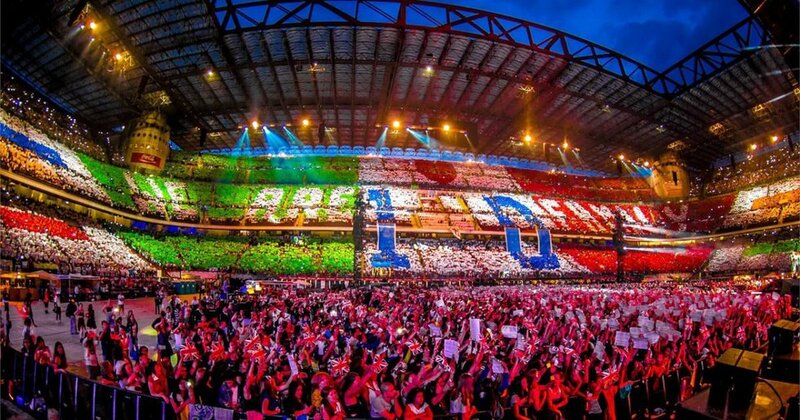 They are planned on Twitter and Instagram, spread around to everyone attending the concert, and usually have ineffable results. I can only imagine what the artists see as they look out into a sea of signs. Signs usually say things like “thank you” to the artists, because they do a lot for their audience. Being a part of these projects gives you a sense of unity as well. The lack of stars in the sky wasn’t a problem for me in the city, because on two nights, I got to see sixty thousand stars lit up across a stadium. I remember looking around the enormous place and seeing twinkling lights moving back and forth, in perfect sync, giving me a sense of peace and serenity. Time stops in moments like these. You feel so small, yet so significant because you are also contributing to the picturesque scene taking place in front your eyes. 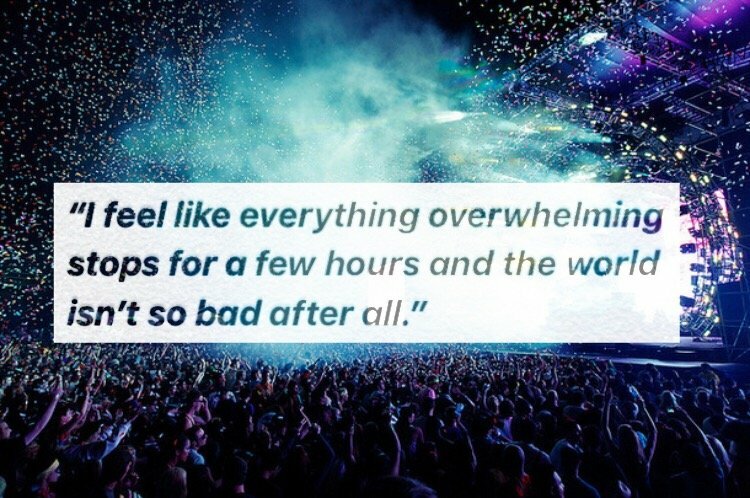 Everyone reacts to things differently; everyone feels things differently, but I think everyone can agree with the fact that concerts bring out pure emotion from people. I’m not big on crying without a good reason, but I can tell you that when I saw my favorite band walk out onto the stage, just feet away from me, I burst into tears. I was shaking and crying nonstop. I had never understood the term “happy tears” before that moment. I was overjoyed and zealous because in that moment, nothing else mattered. 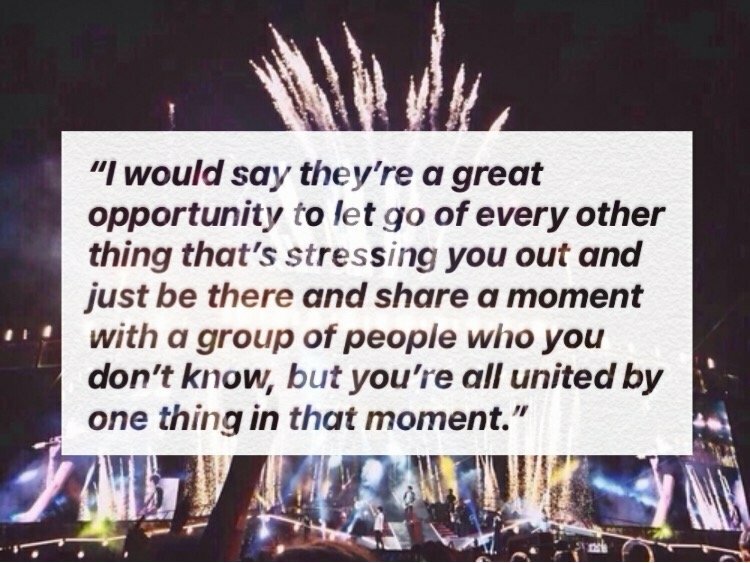 Concerts are often a hub for people to connect or reunite. If an artist is going to one place in a state, everyone from that state who is going will attend that show. This gives people the chance to meet their internet friends for the first time or to reunite with old friends who they haven’t seen a while. Being a fan of the same artist connects people in incredible ways and can create life long friendships. They are able to see each other and enjoy a show that they have been anticipating for months. We spend our lives hearing music and seeing music videos through our phones, laptops, and other devices. For many, it is hard to believe that the people singing are actual people because we never see them. Once they are in front of you, the surreal feeling kicks in and you realize that they are real, they are there, and you are sharing a magical moment. The artist that was there to pick you up when you were having a bad time, is there in front of you. You finally get to hear the songs that got you through your darkest times, and in that moment, there is no other place you would rather be. 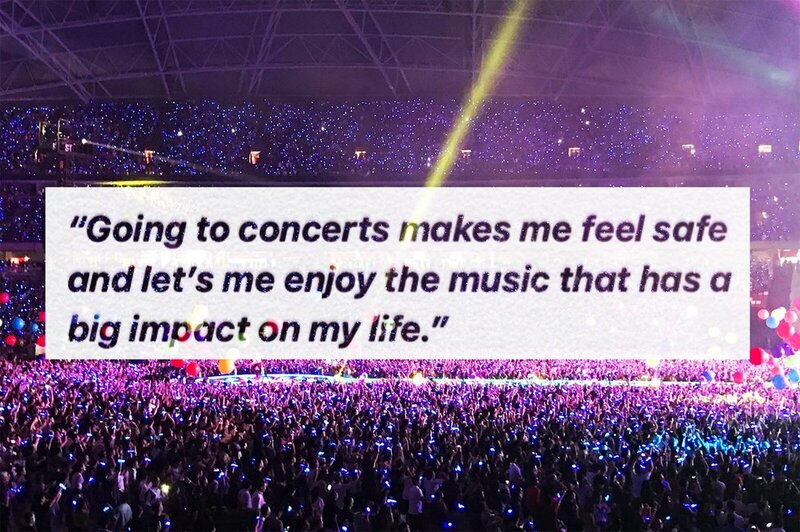 Many fans describe concerts as their home, because they feel safe, loved, and united. The world can be an awful place, filled with people who want to hurt others. Everyone experiences stressful situations and bad moments. Concerts are events that allow you to feel safe and happy. They are places where you can be yourself, sing as loud as you want, and scream until you lose your voice. You can let go of everything for a few hours and focus on enjoying yourself. I miss the feeling of standing outside of Metlife stadium with my fandom, hearing the electrified cheers from the crowds already inside. The excitement in the air is something that I can still feel when I close my eyes and remember those days. Finding my seats, seeing the boys come out, and singing with all I had are things I will never ever forget. I look forward to all the concerts I will attend in the future. I hope that everyone will get the chance to see their favorite artist perform live one day; it’s an unparalleled experience.